How about a hedgehog filled with organic catnip? Real hedgehogs aren’t exactly good playmates for cats, but Imperial Cat has made a mighty hedgehog filled with certified organic catnip! My kitty Oscar, the great indoor adventurer, is happy. Please watch the short video of Oscar playing with his Cat ‘n Around catnip toy from Imperial Cat. The toy also came with a cheerfully colored, curly-looking ball that’s not in the video, but you can see plenty of examples in the photos. I was given one free Hedgehog toy with ball for review purposes. Read more about my disclosures. • It’s unusual. 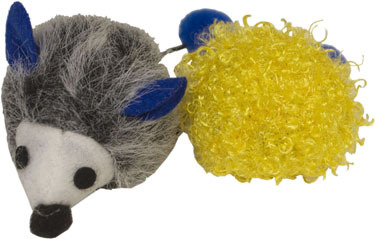 I’m not talking about just the fact that it’s a hedgehog instead of a mouse (though I don’t think the cats care), I like that it has appendages that dangle below the main body of the toy. Watch the video above to see how Oscar likes this feature too. • It makes noise! Cats are motivated to hunt by sound, so silent toys are never winners in our kitty household. • The really soft and uniquely fuzzy cat ball is handy for cats who like to play catch (don’t laugh!). Oscar loves to catch things, though his chosen “ball” is typically a ponytail holder. He carries his toys in his mouth, deposits them in front of me, and stares with pitiful eyes or yowls until I play catch. The organic catnip used in the toy is grown in the US, but the toy itself is made in China. Given that Imperial Cat manufactures their very practical, yet artistic recycled cardboard scratchers in the US, I was a bit surprised to see that the toy was made elsewhere. The Imperial Cat website says they have the “largest selection of USA made toys,” so hopefully they’ll stick with that good habit and maybe also make some toys out of recycled materials when possible. 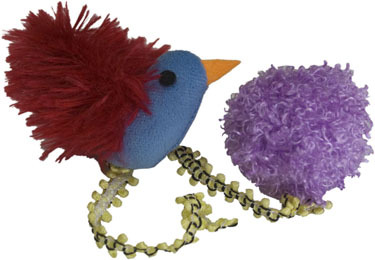 Overall, Oscar has given his hedgehog toy and ball a claw’s up, and he’s hoping that Imperial Cat comes out with more classy looking toys that he can carry around in his mouth! Does your cat play with Imperial Cat toys?